Since its inception, things have been tough for Google Wallet. Adoption hasn't been great, many carriers have blocked its use, and the rollout of new features hasn't gone as smoothly as one would hope. In short, it's been a long, hard road for such an initially promising product. While we've already seen Google cut support for the prepaid Wallet card, the company has now decided to ax NFC redemption of gift and loyalty cards as of August 21st. If you currently have available funds on a gift card that's attached to your Wallet account (and you no longer have the physical card), it's time to spend it, lest it be lost forever. Loyalty cards, on the other hand, are just going the way of the dodo all around – if you haven't kept track of the physical card(s), it may be time to get some new ones. Thank you for being a Google Wallet user. You're receiving this email because you've added gift and/or loyalty cards to your Google Wallet app, and there's a change coming soon that will affect you. 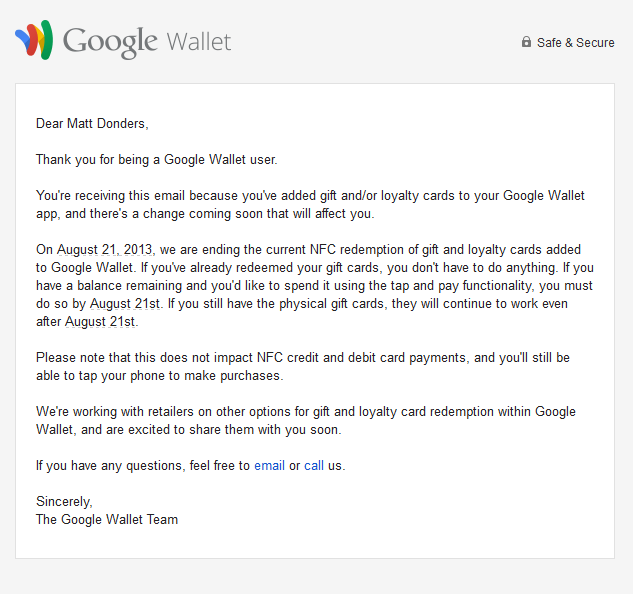 On August 21, 2013, we are ending the current NFC redemption of gift and loyalty cards added to Google Wallet. If you've already redeemed your gift cards, you don't have to do anything. If you have a balance remaining and you'd like to spend it using the tap and pay functionality, you must do so by August 21st. If you still have the physical gift cards, they will continue to work even after August 21st. Please note that this does not impact NFC credit and debit card payments, and you'll still be able to tap your phone to make purchases. We're working with retailers on other options for gift and loyalty card redemption within Google Wallet, and are excited to share them with you soon. Alas, so much for a unified digital wallet.